SOAPBOX CREATIONS: MFT Product Launch.. I simply stamped one of the leaf images all over the background in Sour Apple Premium Dye ink. Then I added in a black banner with the sentiment heat embossed in white. (Isn't that sentiment fabulous? lol!) And last I added in the Amazing cut out of Gold Cardstock. Super Easy! So that is it for today. Stop over to the MFT Blog to see lots more release goodness. Thanks so much for coming by today! Wonderfully designed--love the gold word! Beautiful! The gold "amazing" is, well, AMAZING lol! I so need this set now...totally! And I freaking mean it! And your card is freakin' awesome! Lovely card Laurie, the gold sentiment is fabulous! Wonderful design. Amazing people should just for get a gold amazing. Awesome design love, love your card. Absolutely lovely clean and simple card! So pretty! Soft and beautiful, Laurie! I love the gold lettering!! I love the gold on the card! Such a sweet and simple card, love it! What a lovely background. Love it. So simple and pretty! 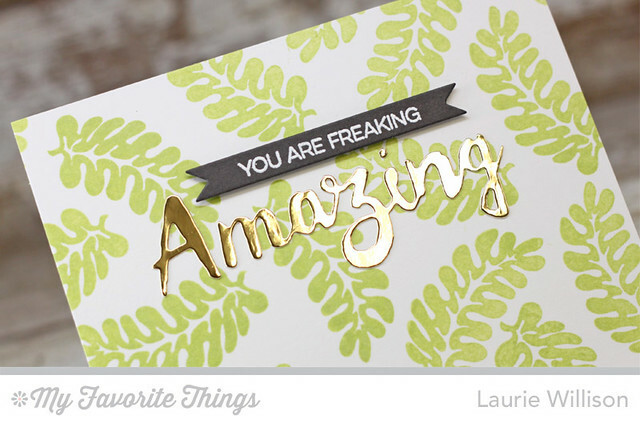 Love that leafy stamp set! I want that amazing stamp set!! Another "just right" CAS card! So fresh and fun! Love that gold sentiment! So clean and simple and fabulous! So pretty! Love the die cut out of metallics. A clean, simple card for any occasion! Love how simple yet classy your card is! :) Simply gorgeous! what a fun card! love the sentiment! I love what you did here. the leaves are an awesome background to the gold and the sentiment. just perfect. I think repeat leaf patterns are special! Love the whole theme of amazing. And in gold, it is utterly gorgeous! I really love that stamp! Super cute card. Love that leafy background and that gold is just wow! 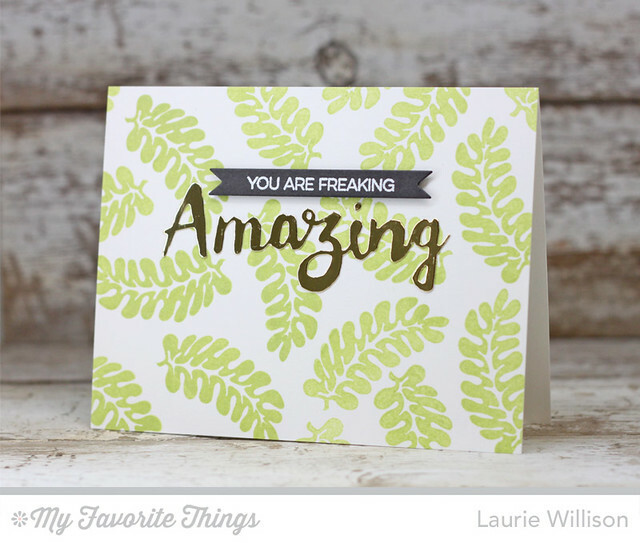 Your card's sentiment says it all!! Great way to make a card that you could use for either gender! What a great CAS card. Great use of the leaf stamp. So much fun, Laurie! Thanks, Paulette S.
This is so fun! Love this CAS style! Love the clean and simple lines. The gold die cut is gorgeous! Great CAS card design! Love the simple elegance! Love the gold wording...Great Card! Great card and I love that sentiment! This design could work well for a masculine card. The amazing sentiment pops up really beautiful from the monochrome background! I love the leaves all over. Great simple card. Thanks for the idea for the leaf background!